With its snappy writing, colorful graphics, and action photography, this guide will score a sure goal with soccer-crazy kids! 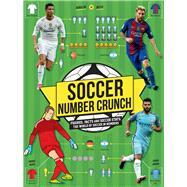 This is the book young soccer fans want, with all the information they need to know. It’s packed with fun facts, including sections on the biggest players, hottest clubs, best international teams, and most important tournaments all around the world. Get the coolest stats on the longest unbeaten run, scoring streaks, record attendances, head-to-head player matchups, and more. Every page is a treasure trove of great soccer trivia. Plus, each piece of data is based around a number, so this book is sure to hook even reluctant readers. Kevin Pettman is a sports writer and editor of children’s magazines and annuals in the UK, including Match of the Day and Match. He is also a regular contributor to Top Gear’s annuals and children’s titles.